Finally! Exhibits at the Gladstone Hotel Art Bar by Me! It was a long thing coming, me finally being ready to showcase my work. Truthfully speaking if it was not that an exhibit were the penultimate result of my internship at the Gladstone Hotel, I wouldn’t have gotten myself ready. What surprises me though, is that in that amount of time, I was able to produce two very different series of photography. One focusing on my love of food and color, the other emphasizing my long-standing love affair with the fall season. For both shows, I am paired with a second photographer. 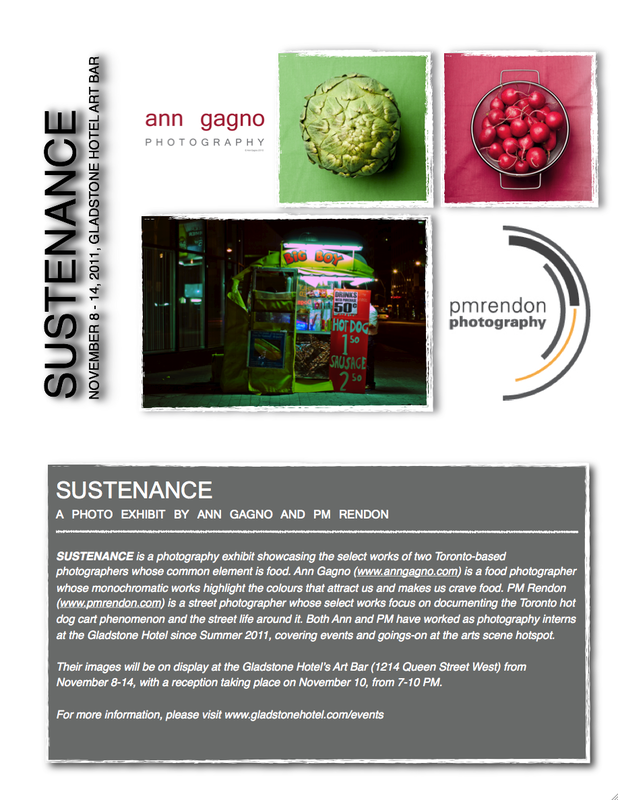 The first show is called Sustenance, a food photography show coming from two different perspectives. My partner for this show is PM Rendon , whose large-format prints of the hotdog cart culture in Toronto is paired off with my food monochromes, a series that highlights the color that beckons us and whets our appetite. This show would be available for viewing at Gladstone Hotel’s Art Bar, starting 8th – 14th of November, with an opening reception on 10th of November, 7 – 10 pm. 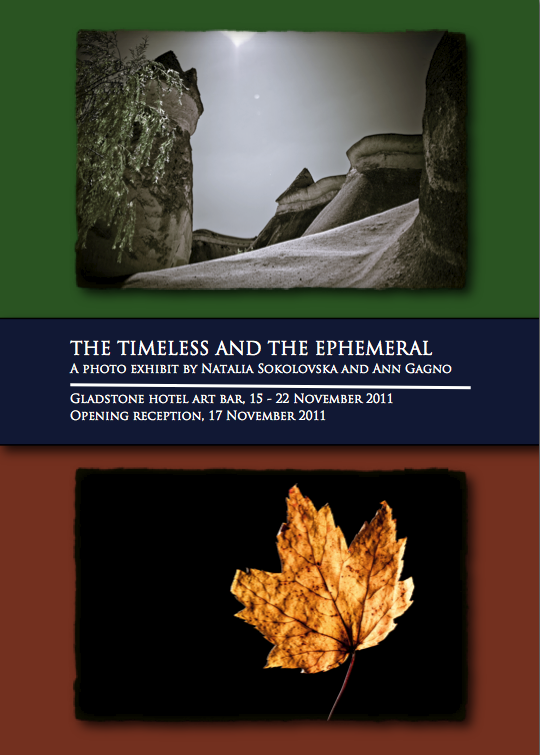 The second show I have my friend Natalia Sokolovska to join me, our show we call The Timeless and the Ephemeral. Natalia’s work focuses on the timeless and nostalgic quality of her recent travels to Angkor Wat, Cambodia and Cappadocia, Turkey. My own work is a stark contrast to Natalia’s as my series is the opposite to what is timeless. I pay homage to the ephemeral rapture of reds that is an Algonquin fall season. The second show would run immediately after my first exhibit. Available for viewing at the Gladstone Hotel’s Art Bar, starting 15th – 22nd of November, with an opening reception on 17th of November, 7 – 10pm. Congratulations Ann! You’re skill have surpassed many others who’ve learned with you at Ryerson. You’ve come a long way and you deserve only the best!